Greenists to Funky Pits: Bring It. If there’s one thing that gets a Greenist’s attention, it’s armpit talk. Do a search on this site for “deodorant” and you’ll get 20 posts that at least mention the word, most featuring intimate details. Let’s make it 21. Blackjack! The brave quest for inoffensive yet chemical-free and environmentally sound underarms almost seems like a right of passage for folks who already take their own bags to the supermarket and carry a reusable water bottle and are looking for the next step. But when it comes to B.O. as opposed to, say, shampoo or toothpaste, many people draw the line. I’ve gotten the sense over the years that there are a lot of people out there making their own yogurt and raising chickens in suburban coops yet steadfastly refusing to forgo the toxic cocktail they smear in their pits, because a hippie is one thing, but a smelly hippie is a whole different level of commitment and ostracism. But we want to believe. Somewhere out there is a magical substance capable of leaving us smelling springtime-fresh with nary a paraben or aluminum chloride in sight, and it doesn’t come in a plastic container. I’ll let you off the hook here: I haven’t found it. But I have found something that works for me. It’s not perfect, but I swear to you up and down that it has worked better than anything else I’ve ever slapped up in the dark, humid recesses ‘neath my shoulders. That doesn’t mean it will work for you, though. If there’s one thing I’ve learned on the quest it’s this: You are smellier than I. Actually, the one thing is this: When it comes to pit stink, we’re all different and what works smashingly for one person leaves another smelling like a Yeti in a sauna. My own Yeti-proofing goes like this: A mixture of baking soda and corn starch with a bit of commercial all-natural deodorant to help it stick. I started off using straight baking soda applied to water-dampened underarms, which I believe was a trick recommended in this space by Allie. I could run five miles and still pass the sniff test, except my pits were getting seriously irritated. Looking into the issue, I discovered somewhere a suggestion to cut the baking soda with corn starch, like a drug dealer trying to get more mileage out of a kilo. I played with the ratio until I settled on roughly a fifty-fifty mix. Enough baking soda to knock out the funk, but not so much that it over-dries and irritates. I already had a stick of Trader Joe’s unscented deodorant, which didn’t work for me at all on its own but is a great first layer to get the powder mixture to stick. Of course, the TJ stick comes in plastic, so I haven’t eliminated that, but I use very little of it so it goes a long way. I keep my deodorant in a repurposed glass cinnamon shaker. When we traveled overseas last year I was a little concerned with how the TSA might interpret my white powdery substance in a container clearly marked as Private Selection Organic Cinnamon, which explains the label you see above, but suspicions were not raised, and I was able to visit the European continent dry and odorless as ever. Anyone like to share their secret to pits you can be proud of? 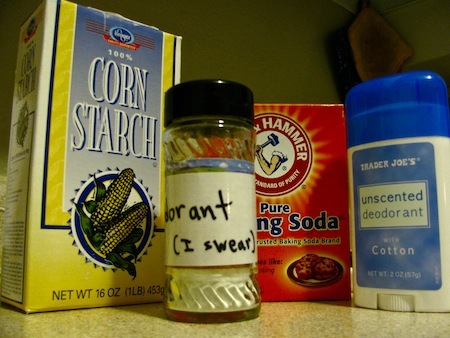 I use a mixture of 1/2 baking soda, 1/2 cornstarch, and a few drops of tea tree oil. I use a blush brush to put it on, so I don’t have to dampen my pits to get it to stay. The tea tree oil kills any smell. Wolf uses it too. He was really reluctant to jump on the bandwagon, but after a year he did. He’s a sweaty guy and was nervous it wouldn’t work for him but it does. Now be touts the benefits to those he works with. Neither of us has had any irritation with this method, and even after exercising, we still smell good. I always wondered whether the powder mixture would leave stains or get caked onto your clothes – does it? I remember some non/un-natural deodorants would eventually leave stains under the pits which were difficult to get out, and I hope this doesn’t happen with the powder. Regardless, I’m game to try it! I started using a deoderent stone in January and haven’t touched the toxic stuff since! I also switched 4 or 5 of my friends over. I don’t know how, but it really works. Lasts 24 hours. I don’t even smell after working out! And the stone supposedly lasts for a year. Curious to see what the summer will bring though. I think this is my favorite line from a Greenists post ever. He’s clever AND he smells good. Never ceases to amaze. I was disappointed with the TJ deodorant alone but when it runs out, I’ll probably try the crystal rocks since they’ve been so well reviewed. Might as well give it a shot. I use the baking soda-cornstarch-coconut oil mix you can find online. Been using it for 18+ months, even in the hot Phoenix summer. Love it. It does not stain my clothes at all, despite the commercial stuff doing so. Per Nat’s concern about clothing residue: I just have to be careful when I put my shirt on to keep any excess white stuff from getting on the outside. After that it all settles in and I think it ends up pretty much invisible. And baking soda shouldn’t cause any fabric discoloration long-term, either. Baking soda is a stain remover, actually. so…it could help clean your clothes and prevent pit stink. I use baking soda in cleaning my cloth diapers.